The Regime Prescription Tool (HEC-RPT) is designed to facilitate entry, viewing, and documentation of flow recommendations in real-time, public settings. HEC-RPT seeks to improve 1) communications in group settings by allowing real-time recording and plotting of the recommendations as they are developed and 2) the recommendations produced by making hydrologic information more immediately accessible to scientists, engineers, and water managers during the formulation process. 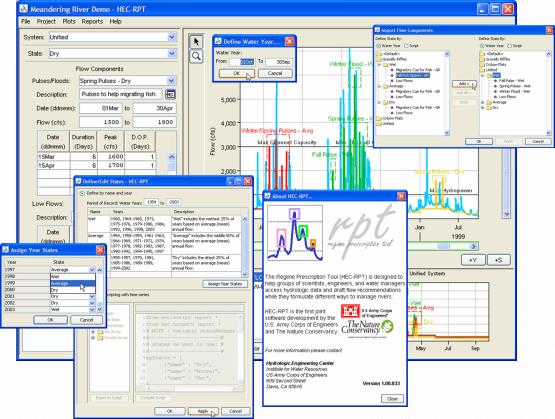 HEC-RPT is primarily a visualization tool and is not intended to perform the detailed quantitative analyses (e.g., statistical analyses or reservoir and river routing) already performed by other software packages. Instead, HEC-RPT seeks to complement other software by making it easier to create flow time series that other software packages can import and use in their analyses. HEC-RPT is the first joint software development by USACE and The Nature Conservancy. Development costs were shared between the Hydrologic Engineering Center, Portland District, and The Nature Conservancy. This work was undertaken in support of the Sustainable Rivers Project, which is an ongoing nation-wide partnership between USACE and The Nature Conservancy to improve the health and life of rivers by changing the operations USACE dams, while maintaining or enhancing project benefits.